Did you all Hip Hop last night? Unity has dedicated a whole sub forum to Hip Hop. You have to check it out! There are fun challenges, prizes, and lots of fabulous friends! This is a card I made for THREE different challenges yesterday. The ways to use was watercolor paper and I hardly ever watercolor so I just used it as another layer. Then Jeanne issued a challenge to use clear elements on a card. But mostly, this is for the Limelight sketch challenge. 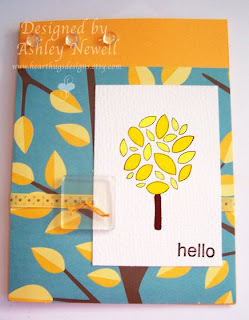 Mandy challenged us to use the sketch and some of our favorite products to make a card. So, I used my most favorite stamps, Unity. And I used dew drops, you know how I'm addicted to those. And a button. I love buttons. So, I am SO Hip Hop Hungover right now! Actually, I stayed up late reading but I would have read earlier if it weren't for Hip Hop. Hope to see you there next week! How AMAZING is that for a match? Perfect DP and an awesome card! Hello! Late night reading is the BEST! Thanks for always joining us for HIP HOP! Your card is amazing! I love it so, so much! Hope you are feeling well. enjoy your weekend! Hey Ashley I wanted to let you know I can not remember if you told me the card has to be posted by 1pm or noon, but I have to run my 1 year old to the Dr. and then I will post it. I have it done though! I took inspiration from 5 of her creations and made a card from those! Oh I forgot to tell you .. I love your card! I love that set it is son nice! Great job and you sound much better I hope that means Brady is doing well! Love the card! Hip hop was fun last nite, eventho SCS didn't want to play nice for awhile! Can't wait for the new Etsy challenge! very cute! i like you blog too.. way cute! Looks like your creative mojo has returned! Great card. I love the happy colors. I thought you said you had no mojo? If I could create like that *with* mojo, I'd be just awesome! Ohh this is just stunning Ash!!! I love the colors and the dew drops!!! Love the card. Supercool design, everything in it works so well together! This is the best card you've ever made!!!!! I love it! Sweet, bright card!!! Love the colors! It is prob. way to late but I just got the pictures on my blog, however I am having major issues and my computer needs to be shut down and re-started before I can edit the post and tell why I did what I did, but if you are online and want to see the pictures without the info they are there. If I am to late I understand today has been horrible like your week was earlier this week with Pre-school and sick baby, and Dr's appointment and waiting forever at the Dr. You know what I mean?? Love this card Ash! I have this dp too - isn't it the cutest! Your mojo is shining through on this one!! Love it!! That paper with that stamp is perfect! !